Purchase a cozy sewer home ideal for a thief. Purchase Shadowfoot Sanctum from Vekel the Man for 7,500 gold. This short quest will be added to your journal upon installing the Shadowfoot Sanctum Creation. You will be directed to speak to Vekel the Man in The Ragged Flagon, an underground tavern located in the Ratway beneath Riften. He will offer to sell you Shadowfoot Sanctum for 7,500 gold. You will be given a key to access the sanctum upon purchasing the property, which is located a short distance from the Flagon's entrance. 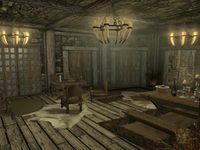 It is a fully-furnished player home with a hidden entrance and lots of storage, ideal for members of the Thieves Guild. It contains many crafting stations and shrines as well as space for your spouse and adopted children. Enter Shadowfoot Sanctum to complete the quest. On the PC, it is possible to use the console to advance through the quest by entering setstage (?) stage, where stage is the number of the stage you wish to complete. It is not possible to un-complete (i.e. go back) quest stages, but it is possible to clear all stages of the quest using resetquest (?). This page was last modified on 24 March 2019, at 17:15.